Patients at BC Children's Hospital in Vancouver, Canada, will never forget the name "Jack Sparrow." That's because Johnny Depp -- the captain himself -- paid them a surprise visit on Monday, dressed dread to toe as his character from "The Pirates of the Caribbean" movie franchise. "The charismatic character charmed patients and their families alike, leaving smiles and laughter in his wake," a spokeswoman for BC Children's Hospital told CBS News. "He was at the hospital for more than five-and-a-half hours, never once breaking character." "Captain Jack" stopped to snap photos with fans, engage in playful sword fights and compliment eye patches as he aimlessly roamed the hospital hallways. "How do you do? I have no sword. I come in peace," Depp told young patients as he shook their hands. 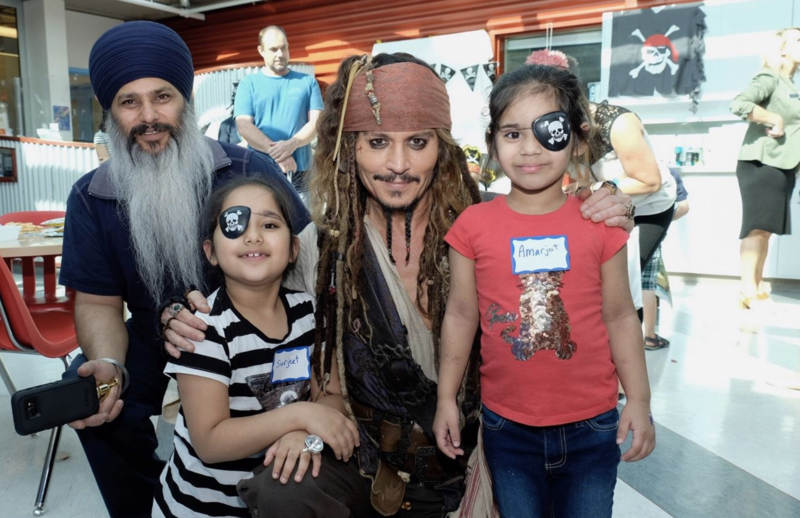 The actor even helped host a pirate party for a group of kids in the afternoon before continuing his hours-long visit, which ended with one-on-one meetings with patients in the oncology, general pediatrics and neurology wards. In total, "Captain Jack" spent quality one-on-one time with nearly 70 children, the hospital added. Patients and families seemed to enjoy the famous pirate's company, some even calling it a "dream come true." "He never broke character once and was so generous with his time," Sarah Kertcher said after Depp met with her 7-year-old daughter, Madison. "He was truly here for the kids and it brought tears to my eyes to see how special he made each one feel." The Kertcher family, as well as dozens of others, had no idea the actor was going to make the trip. "I didn't wake up in the morning knowing I was going to see Johnny Depp today," another patient noted in a video that was posted to the hospital's Facebook page. The video has been viewed more than 154,000 times since it was posted late Monday night. This isn't the first time Depp surprised his fans with an impromptu performance. In April, the actor surprised riders on Pirates of the Caribbean at Disneyland in Anaheim, California. The actor gave visitors a great performance by employing Sparrow's signature mumbling, sword-pointing and repeating lines from the film. He also paid a visit to a children's hospital in Australia in character back in 2015.